Plymouth resident Joe D’Eramo, principal of HiRoad Communications, today announced it has entered into an affiliate relationship to sell Matt Furey exercise products. A former wrestling and martial arts champion, Matt Furey developed a line of body weight conditioning programs. In addition, he’s the best-selling author of Unbeatable Man. “I first became a fan of Matt Furey products after my daughter was born. I didn’t have the time or money to go to a gym and needed something to try and stay in shape. Matt Furey’s Combat Conditioning DVDs taught me exercises that gave me a superior workout without using a machine, without leaving my home in about 15 minutes,” said D’Eramo, a freelance copywriter. HiRoad Communications (www.hiroadcommunications.com) provides copywriting services for a wide range of business-to-business and business-to-consumer clients. And while D’Eramo is a devotee of Furey’s exercise products, he’s also an admirer of his ability as a communicator and writer. 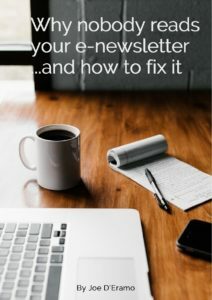 In addition to writing content for ads, articles, brochures, direct mail, newsletters, press releases, sites, and other collateral materials, HiRoad Communications recently published Why Nobody Reads Your Newsletter…And How To Fix It. This free troubleshooting guide stresses the importance of small businesses seeing their newsletter through the eyes of their target audience. For more information on HiRoad Communications or to download a free copy of Why Nobody Reads Your Newsletter…And How To Fix It, go to www.hiroadcommunications.com. To discuss potential writing projects, you can e-mail info@hiroadcommunications.com or call 617-848-0848.